And so our first venture into Custom Content was much more muted: a modified version of an already functioning object—but more than a mere decoration. Slot Machines #4 and #5 represented a collaboration of S1ndle’s inspired vision, Raeven’s sprite, SimAntics, & under-the-hood expertise, and my keen ability to pretend like I belong in a trio of creative people, and their implementation served as a solid proof of concept that Custom Content and the creativity of the FreeSO community can and will be an important aspect of the future of this game. But after seeing that Texas Hold’em Table artwork (and knowing it was just sitting there for months) I knew I had my work cut out for me, but I was going to bring that idea to fruition—or die trying. Months of effort went into making BlackjackEOD—from sorting through the rat’s nest of half-finished changes from what was clearly a direct copy of roulette.iff and roulettesemiglobal.iff, creating and implementing abstract and literal visual card deck classes, to piecing together the most idiosyncratic symbiotic—theatre, as I called it—animations and transitions to somehow simulate the flow of a simple stupid blackjack game. The fruits of my labor were rewarded with a fully functional blackjack game, driven mostly by Sim to Sim (player to dealer) communication. But something was definitely missing, definitely lacking. BlackjackEOD proved to be the most ambitious EOD that I would tackle so far. Exhausted of my capabilities, I turned the keys over to Raeven to add some finishing touches. It was more like pure wizardry (or maybe black magic? ), I realized, as I had to pleasure to watch her transform a fairly dry and clean cut object into an extremely believable and immersive imitation of a real life experience. If I made that object work, she made it worth using. She doesn’t know it, but she’s a good teacher, too. With BlackjackEOD under our belts, it was time to finish what initially brought us together. But we had already demonstrated to the community that Custom Content is possible… So this project needed a new aim. Sure it was distinctive in that it was literally built from the ground up using Maxis assets and custom artwork (and code), but what else can we offer the community as we move closer to release and closer to opening the floodgates for CC? A guide to making Custom Content. Custom objects, custom artwork, custom EODs. Naturally, as is a pattern with me, I did not know how ambitious an idea this would turn out to be…In fact since finishing BlackjackEOD and moving onto this project, I actually spent twice as much time on my written guide than I did on the Hold ’em Poker content. 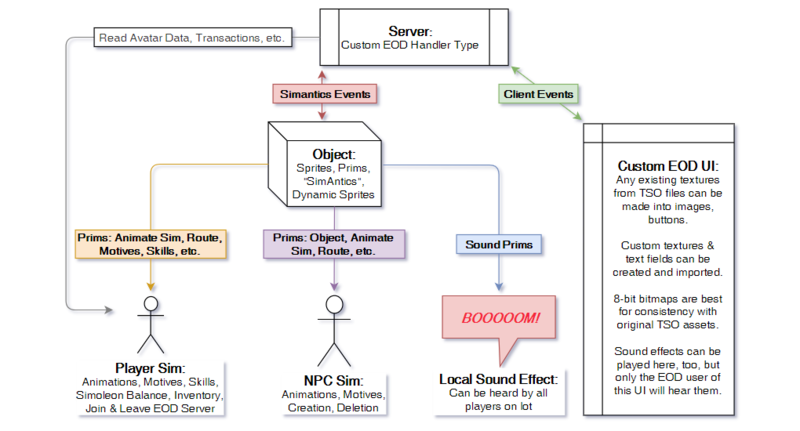 But yes, I wrote an entire guide to creating a custom EOD from start to finish. It exceeds 15,000 words. While we aren’t quite ready to accept submissions for Custom Content in FreeSO, writing custom EODs takes quite a bit of time. My hope in releasing this guide just before we have our CC guidelines and submission steps established is that those (few) of you who wish to author your own uniquely immersive and interactive experience may have plenty of time to familiarize yourselves with this idiosyncratic and quirky system. So without further ado, I present my completed guide for creating custom EODs from start to finish. I look forward to seeing the world of FreeSO expand and be filled with your creative, immersive experiences.